Sometimes you have a harmonica with the wrong scale. It is hard to scale it down. A simple solution is to buy harmonicas in all scales. It will cost time and money, but it might save the day. If a manager walks into your cubicle with a suggestion to scale down tests, then it is time to get the big picture before the decision to skip tests. Let’s go back to George. At eleven o’ clock in the morning George joined the meeting of the software testers. Cynthia was not looking very happy. “What’s wrong with you, Cynthia?”, George asked. “Management decided to skip the user acceptance test for the navigation system to save time.”, Cynthia answered. John joined the meeting of the software testers. George was studying his laptop. “According to the user story it is possible to enter the right destination using voice commands within 10 seconds. “The destination is Paris.”, Pete said. “What is destination?” was the answer of the navigation system. 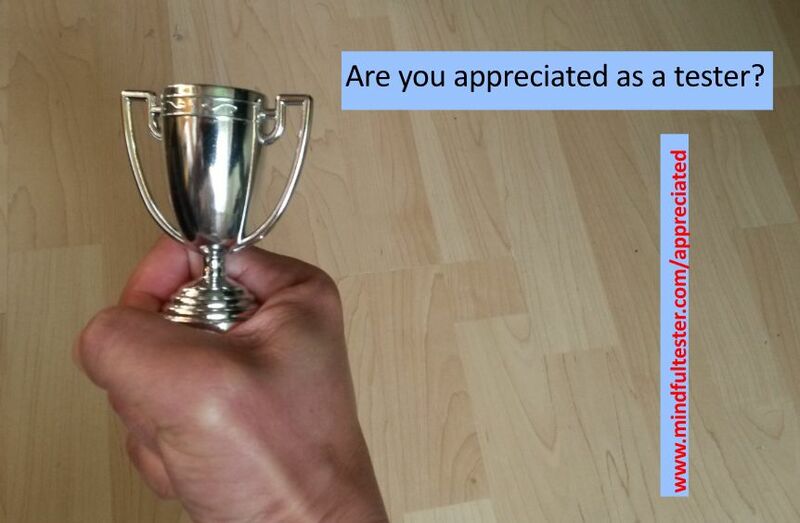 Are you appreciated as a tester? Request Huib Schoots to sign a certificate of authenticity, that he gave this cup to Han Toan Lim for the most intensive and concentrated test session at .. The consultant with a strong HR background in IT looked at me. “I already did.”, I admitted. Then she prepared me, that something worse would come. I steeled myself. The next kid said: “Police agent.” The voice of the animator became enthusiastic: “Police agent. Did you hear that: police agent. That is great!” My wife was not pleased. Neither was I. On my last day in the office and my last workday I noticed, that one of the functional application managers had not dropped by to say goodbye. So I went to his desk. The talk, that followed, was about gone times, the present time and times to come. At that very moment I really felt appreciated as a tester. 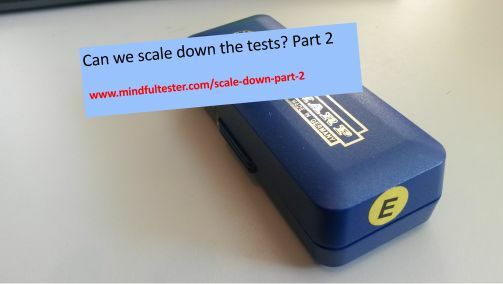 Can we scale down the tests? The harmonica is a music instrument to carry with you easily. It has a disadvantage. If you have one with E scale, then it is difficult to play songs in another scale. You miss tones and it is harder to change tones. There are different solutions to this problem: you could bend tones or just buy a chromatic harmonica. But it will still be awkward to play tunes in another scale. So it is difficult to scale down. 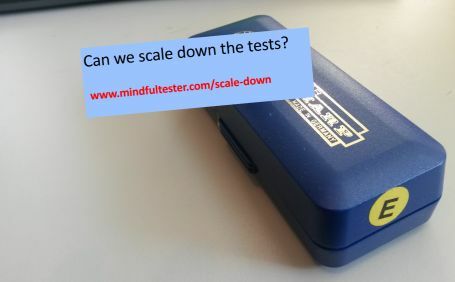 If a manager walks into your cubicle with a suggestion to scale down tests, then it is time to get the big picture before the decision to skip tests. Let’s go back to George, my favorite fictive tester, and his fictive testers, whom he coach, and their fictive technology. At eleven o’clock in the morning George joined the meeting of the software testers. “Yes, I just got back from Texas”, Pete said. Pete started fiddling with his smart phone. “You really have to see this. On screen Pete came walking with a filled bottle of Vodka. Chuckling was heard from the speakers and in the room. Pete put the bottle on the ground and started the car. He drove a small circle around the bottle. Another circle followed by another one. The circling continued and the car started to gain speed and slip. The sounds of the car became harder. The car stood still and Pete got out of the car dizzy. He pulled out a breathalyzer test from his pocket and blew hard on it. The man with red cap snatched the test from Pete´s hands and observed the test. At the background the voice of a mechanic was heard. Before the red cap knew, what was happening, he gave a high five. The red cap was impressed. This summer I went to an extraordinary museum about cars. In the Louwman Museum in The Hague cars, which are landmarks in the history of the automobiles, were shown. The range was from motorized carriages to more familiar cars on the road. The owner had also a special interest in strange cars. I discovered, that electric and hybrid cars were already used at the beginning of the 20th century. 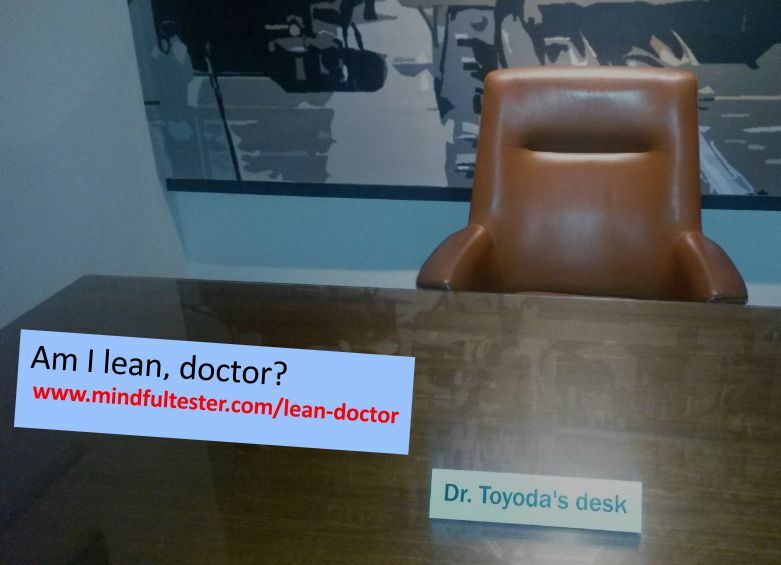 Then a piece of furniture drew my attention: the desk of Dr. Toyoda. He worked for Toyota, which has a special approach for Lean Management. For the test project I had two iterations, which took 3 weeks each. My planning for an iteration was simple: two weeks for the functional tests and the last week for the user acceptance test. To be more precisely 40 hours in the last week for 3 end users. I mailed the test plan to everyone and I got polite decline from the end users. In a normal week they had each 8 to 12 hours left in a week. So ideally 36 hours of testing would be filled in. But it was still too short. Overwork was no option. It was time to reschedule the activities. A few months before I had bought The Toyota Way. It was mentioned several times by experienced Lean practioners, so I bought after browsing it. Heijunka, Level out the work load, came to my mind. If I somehow could move the testing hours of the end users towards the beginning of the test iteration, then the planning problem would be solved. Suppose function A was successfully tested during the Functional Acceptance Test (FAT), why should I wait to let this function tested by the end users? If FAT went well, then the first functions could be tested by the end users in the first week of the iteration. So I made new calculations: in worst case I have 3 end users, who have 8 hours left in 3 weeks, then I come to a total of 72 hours of testing. The new test planning was easily accepted by the end users. 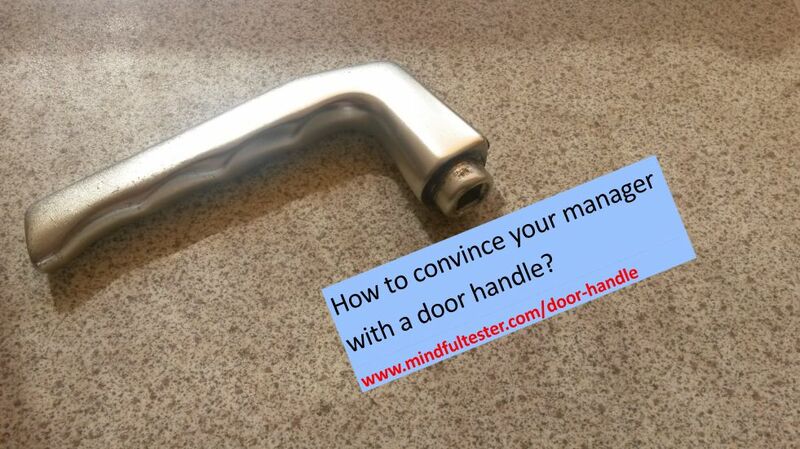 How to convince your manager with a door handle? “How much time do you need to test this? “ my manager demanded. I looked around for a simple object to make my message clear. A powerful trick I learned from a senior business consultant. My eye fell on the door. So I continued: “What would you test, if they only replaced the door handle? The atmosphere changed in the room: she understood it. “If the building has been replaced, would you test the structure of the building before testing the door handle? If the complete wing has been replaced, would you check the water pipes and electrical wiring before testing the door handle? 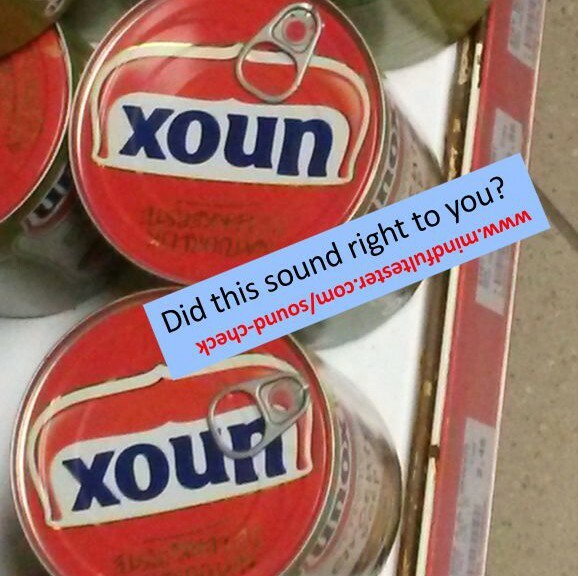 Did you test it long enough? At the beginning of this year I was in a restaurant. It was possible to buy a drink. So the software, which took care for the supply, was good. Also the training of the people was good, because I bought more than I intended to. There was one problem: how can I empty the bottle with this straw? My first thought was: did you test it long enough? 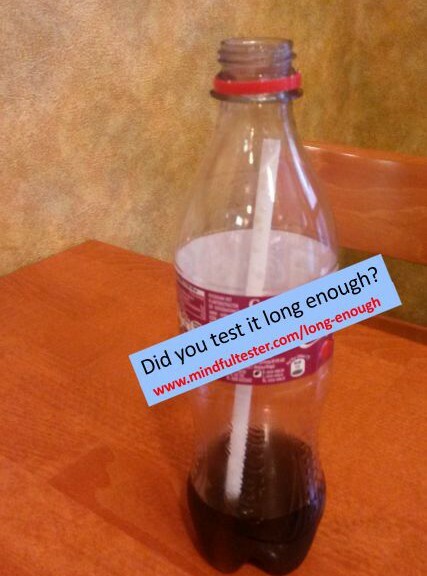 As a tester I have heard many variations: What were you testing? How did you spend your time? Or did you pay attention during testing?